For the year prior to arriving in Colombia we lived mostly on small, quiet islands. The crowds, traffic and hustle and bustle in Colombia has been a little overwhelming. Mark and I use public transportation at most of our stops. 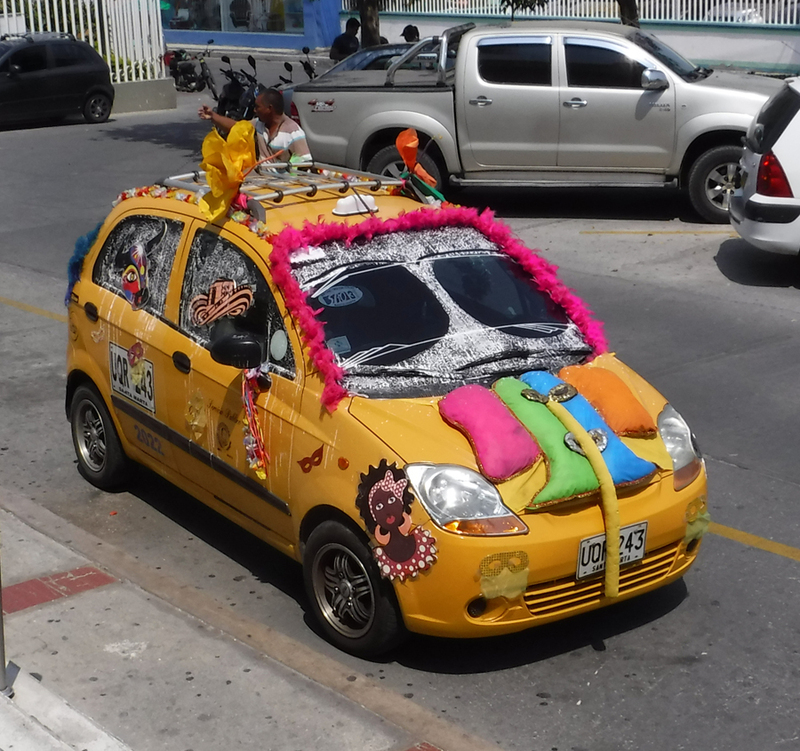 In Colombia however, taxi cabs are more convenient and very affordable. I have been trying to figure out the rules of the road while sitting taxi cabs. Today’s cab ride took me on two shortcuts through gas station parking lots. I know there are rules, but they seem to be the best, most bravest driver wins. I have yet to see a traffic accident. I have seen a few banged up cars so it must happen. Everyone seems to merge together but it seems the most aggressive driver wins the slot in traffic. I know the drivers understand the confusing rules so I am happy to let them drive. I should probably just look out the passenger side window at the city as it flashes by and not look forward. Hum…Wonder if we’ll be able to get a cab? 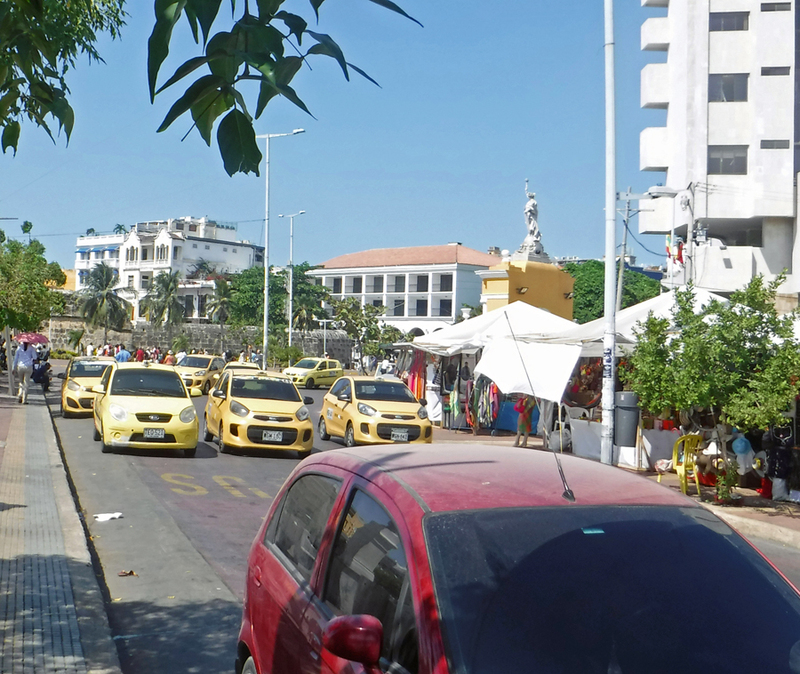 When we first arrived in Santa Marta we were not sure how to contact a cab for a ride. It is different in every city or country we visit. Will anyone understand our really bad Spanish? Do we call a cab company to pick us up? Do they use apps here? We decided to walk in the general direction of where we needed to go and try to flag down a taxi along the way. I happened to be gesturing in conversation with Mark as a taxi passed the crossroad ahead of us. The cab thought I was gesturing to him, which sort of worked in our favor. To the dismay of other vehicles, the cab driver hit the brakes and backed up the busy one-way street. We were less than half a block from where we started walking. I guess it is pretty easy to get a cab after all. I have since learned that all a person needs to do in order to get a cab in Colombia is to stop walking. Within seconds a horn will honk or lights will flash from a tiny yellow cab signaling they are available. 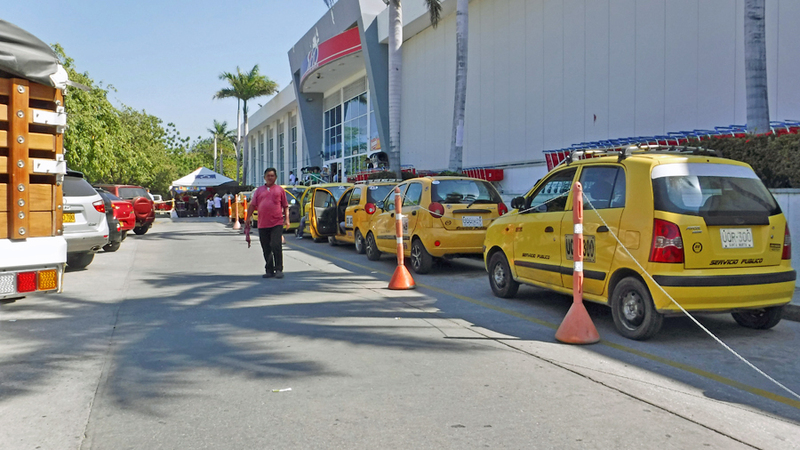 Competition here is steep in all businesses, taxi cabs are no exception. Even though there are meters to calculate the cost of the ride we have yet to see one being used. When we first arrive I inquire with with the marina staff or hotel personnel as to the approximate rates. We have found the drivers have been honest and fair. Only on one occasion did a driver try to charge double the rate. We were inside the Walled City in Cartagena. The driver quickly lowered the rate when I politely explained to him the price we paid the previous day. It is sad to say but tourists visiting the Walled City can be charged double or triple the going rate for a ride back to their cruise ship or hotel if they are unfamiliar with the rates. 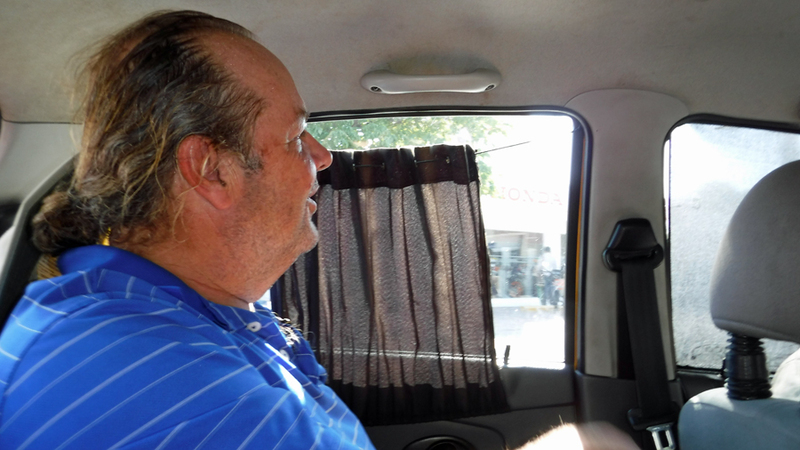 However, most cab drivers are honest and we are very generous to those who are honest toward tourists. 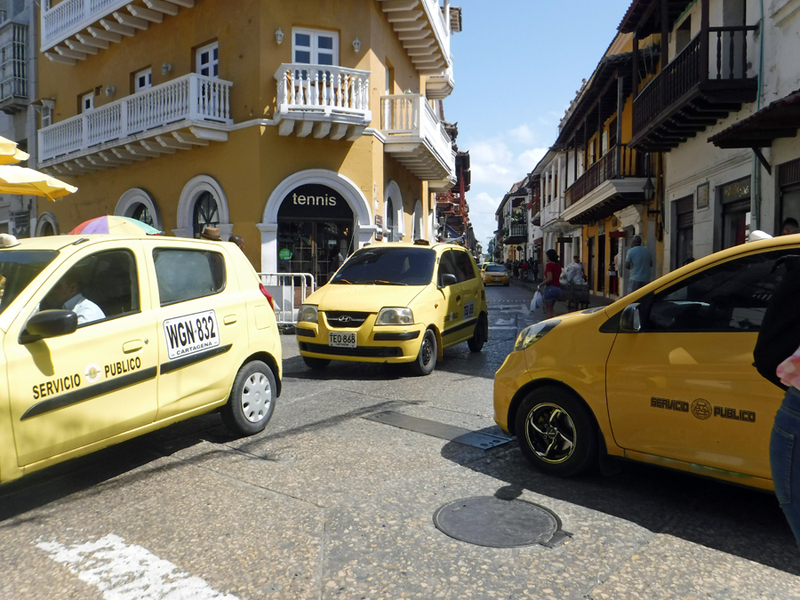 Speaking of tourists and cabs; in Bogota tourists are warned about so-called “millionaire rides.” This is becoming less frequent but still frequent enough to continue to warn people. The driver and an accomplice will kidnapped the rider, drive the rider to multiple cash machines and order them to withdraw money. After an hour or two the rider is dropped off at some random location along the street. 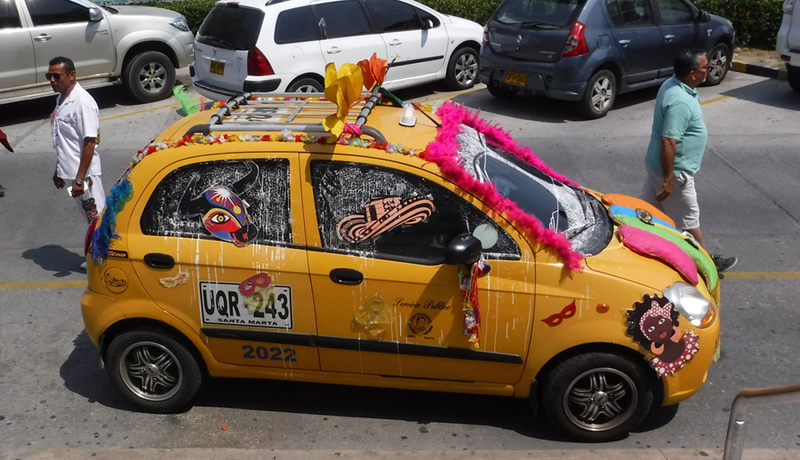 This is only one of the reasons it is recommended tourists use apps to call for taxi rides in Bogota. It is also recommended the rider take a picture of the cab’s license plate making sure the driver knows the picture is being taken and send the picture to someone. Good information to have if something does go wrong. 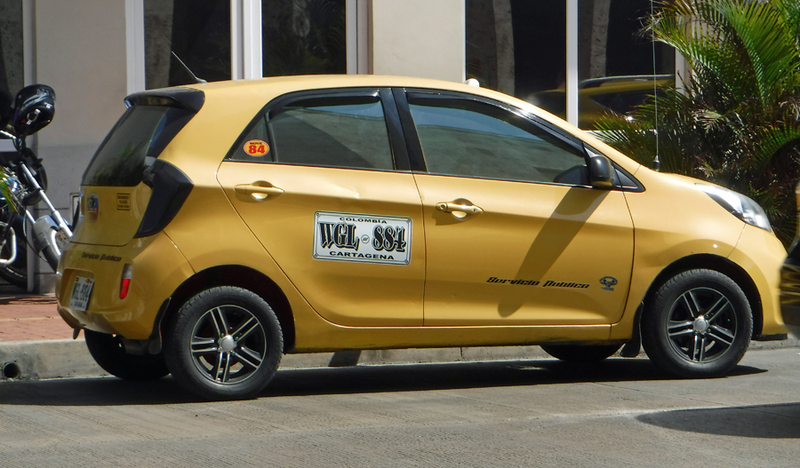 The license number of each cab is on the back, both sides and the roof as well. Inside the cab the back seat can be a tight fit depending on the height of the driver and how far he needs his seat to be pushed back. Mark and I bounce along in the back seat with our packages on our laps and our knees touch the front seats. Some drivers will offer to put our packages on the front seat so we can be more comfy. Despite the tight fit we have seen as many as five people squeeze into one of these cabs. The cars all have air conditioning and some have added curtains to block out the harsh sun. Most are clean, comfortable and have a variety of music accompanying the ride. There is a sense of urgency as the drivers whip us through town often driving down the middle like a fire truck racing to a fire. It is a numbers game, the more fares the better the day has been. The drivers will often try to overtake the car in front only to slam on the brakes for a parked car, pothole or pedestrian that was hidden by the vehicle in front. If the cab is stopped for any reason horns start to honk. Time is money and being stopped costs both. I don’t know how the drivers do it. They must have incredible focus. The roads are narrow and made even more so by cars parked along the edges. Motorcyclists ride in the middle of the road between cars. Pedestrians cross the road willy-nilly and often dart from between parked cars. Despite the obstacles we are delivered safely to our destination with a warm smile and gracias. I have never felt unsafe or worried while riding in one of these cabs. I know this is their livelihood and they would not jeopardized the rider or their taxi by taking risks. The fun shortcuts and quick maneuvers are all part of the adventure. I enjoy our adventure rides and always look forward to the next one. The driver really got into the spirit! I love it!